The dhb wetsuit has been designed specifically to offer exceptional buoyancy. This will raise you out of the water and reduce drag, allowing you to glide more easily, and faster. The use of different thicknesses of neoprene for different parts of the suit ensures you have the flexibility you need for every stroke. This includes thinner neoprene on the underarms for a better range of motion. As well as making the suit more comfortable whilst swimming, it also ensures both durability and speed. The fit has been refined for 2017, ensuring it's our most comfortable and streamlined suit to date. dhb Hydron Wetsuit is rated 4.3 out of 5 by 198. Rated 5 out of 5 by Prudwigs from Great value product Great product and great service from Wiggle as always. Rated 5 out of 5 by nunorainho from Excellent option for an affordable price Excellent quality for na afforfable price. This is the wright swim suit for anyone that does'nt want to invest a lot of money on a top brand but still expects for a very reasonble quality and performance. I definitely recomend. Rated 4 out of 5 by Benjbans from Great wetsuit, wrong size The guiding size issue has no variance on athletic bodies and as a result the wetsuit was too tight. Although, good quality wetsuit. Rated 3 out of 5 by Ghy2 from Good suit, questionable durability Was a great wetsuit, but the seams came apart after only 12 months, of which it wasn't used for 6 of them. Disappointed in longevity so won't be buying again. The XS would be the best fit for you here. Hello, I am 179cm tall and about 81-82kg. Can you help me with correct size? M/L or L? Thanks.. The M/L option would be best suited for your measurements, particularly your weight. Which size would you recommend? Thanks. I would advise the medium size for you. I can confirm the Medium/Tall would be the better option for you. I'm looking for first wetsuit. Lean body, 191см (6,3&quot;), 81 kg, Chest 96min/103max. Which size is recomended for me?? 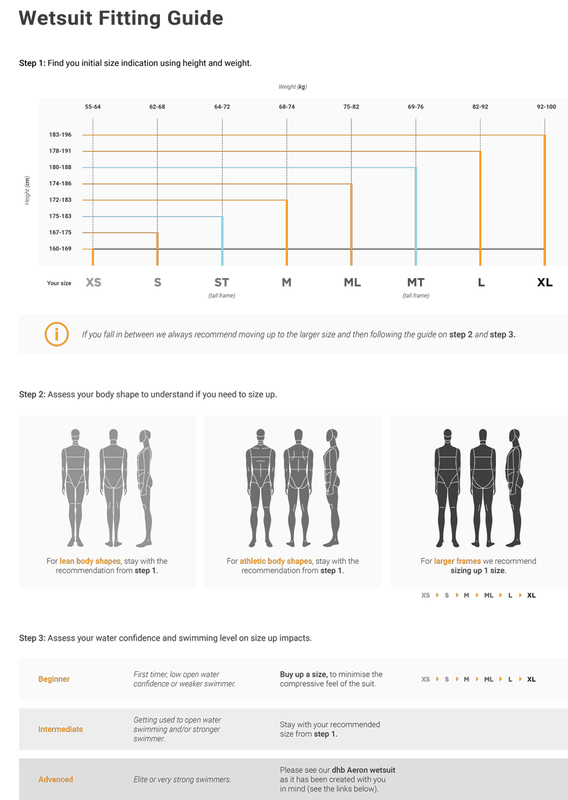 Based on your measurements we would recommend you the Large size dhb Hydron Wetsuit. Sadly we cannot guarantee that the size guide will be 100% correct as every person differs in shape and size which is why we trust customers will ensure they are happy with the fit of the item before using it. I hope this helps. I would suggest that the medium/large should fit best. Hi I am a beginner, 183cm tall and weigh 82.5kg - please can you advise if i should buy a large or the medium/tall? Hi, I'm going to buy my first wetsuit. I'm interested in long triathlons. My arms and legs are slightly shorter for my tall. Which size would you recommend to me? Thanks for answers. I would suggest that the large would work best for you in these.